Catalina first began building yachts in 1969 and immediately made their mark on the cruising world with the innovations of designer Frank Butler. Over the following five decades, Catalina has produced a number of outstanding yachts, winning accolades and industry awards thanks to their quality and continued innovation. The Catalina 36 has become a staple line from Catalina, with over 3,000 built since 1982 when the original 36 MK I was introduced to the market. In 1995, the 36MK II hit the market with a better resin construction, easier access to the head from the v-berth via a second door, and the aft cabin and cockpit were made more spacious thanks to the MKII’s beamier stern. WESTWIND is a great example of all that the Catalina 36 MK II has to offer. Sailed locally on the Chesapeake, her bright interior offers plenty of natural light and ventilation for the two cabin, one head layout. Very well maintained and thoughtfully updated, the hull both above and below the waterline is in excellent shape. The overall layout of the boat, both above and below decks, is really well configured for long range cruising as well as living aboard for days long or multi-week trips. Catalina makes a great cockpit with long benches for lounging, great access to both helm and primary winches during short-handed sailing. Visibility is excellent from the helm. The C36 is one of Catalina’s best and longest running models. Stepping aboard, it’s clear these owners have been very conscientious and have kept up with maintenance as required. She accelerates well in light air and keeps her composure as the wind builds. We took her out for a shake-down cruise and were very impressed with both her performance and condition. Catalina is really well known for spacious interiors that just work. Berths are easy to access. The galley has ample cabinet space and storage. The main salon seats several people comfortably. There’s plenty of natural light, great ventilation, and easy access to interior mechanical systems. Nicely laid out, and efficiently installed, Westwind’s systems cover all the basics. The Garmin chart plotter at the helm is bright and ergonomically friendly (as all Garmins are). The Raymarine wheel autopilot worked smoothly in some choppy seas during our test run. All the necessary gear is at the helm where you need it: chart, autopilot, depth, speed. Though completely functional, the chart plotter could be updated and enlarged. Awesome access! Universal diesel has been regularly maintained. Relatively low hours for her vintage. Fuel injectors were serviced recently. Owner has constantly maintained engine and has supporting service records. I’m a chef and this is chef’s galley for sure. Great counter space. Fantastic fridge space. Storage compartments and spaces are thoughtfully laid out for maximum efficiency and DEEP. We like that the galley is out of the way of passage through the yacht. The chef does not impede traffic flow through the boat. The head is smartly configured and easy to use. Sails in very good condition and should have some years of life left. For you performance sailors, you might want to update them. Dacron cruising sails stretch a bit over time and you lose a little performance. They are removed each season, examined/serviced at a loft and stored indoors for 6 months out of the year. Remember that these sails have never left the Chesapeake Bay so they’ve had a very gentle life thus far. We easily accelerated up into the 6-7 knot range in just over 10 knots of wind, a testament to Catalina’s sail plan and rig configuration. 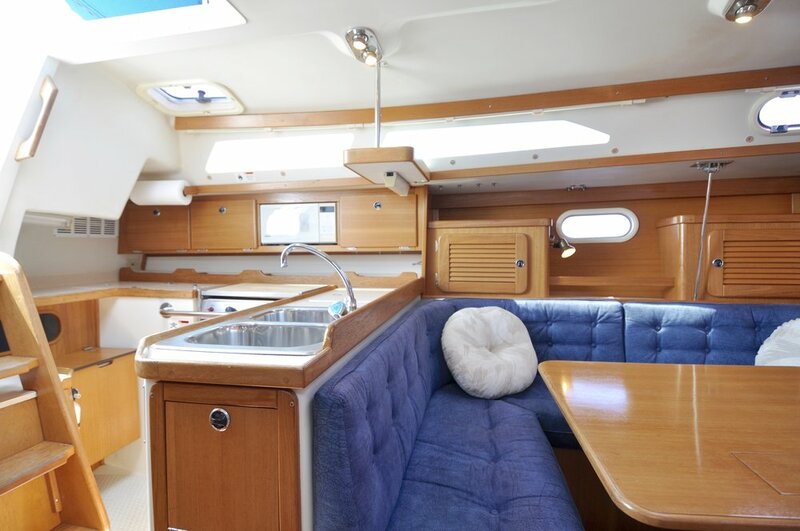 Stepping down the centerline companionway hatch, you enter the spacious main salon of the Catalina 36 MK II with a gourmet galley to port, a navigation station to starboard and a comfortable main salon, perfect for relaxing after a fun day of sailing. The L-shaped galley offers plenty of space for food prep and storage while the U-shaped port settee comfortably seats 4 for a meal. Two comfortable individual settees to starboard have a cocktail table between them that can be lowered for additional seating. A large head forward of the main salon bulkhead has dual access from the salon and the forward v-berth cabin. 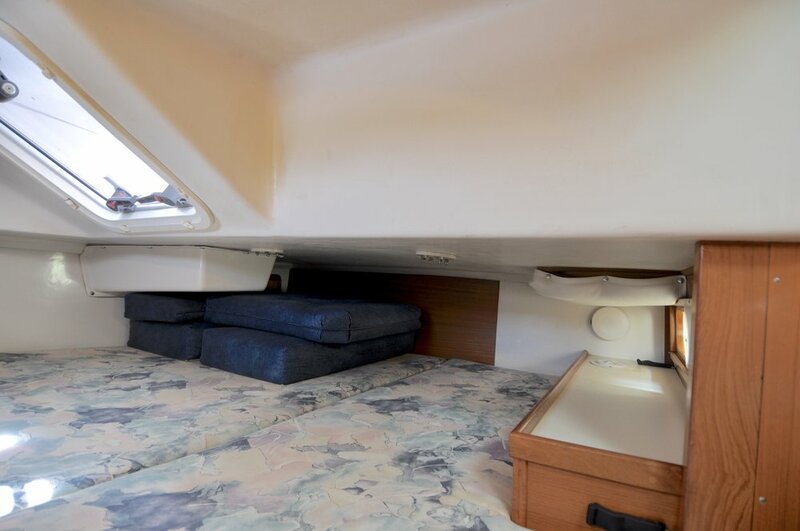 The double berth aft cabin can be accessed to the starboard of the companionway hatch. Below deck’s you’ll find a warm, rich inviting interior space for lounging at the end of a cruising day. A gourmet galley lies to port, nav station to starboard, and a spacious main salon that takes advantage of WESTWIND’s 12’ beam completes the main living space. There’s a comfortable sitting area with a beautifully varnished coffee table between two individual seats forward of the chart table. There’s a large U-shaped settee to port that offers a great space for dining or for kicking back to relax. There is a large dining table that comfortably seats 4 or drops down to make a comfortable double berth. The main salon also offers seasonal comfort with reverse-cycle air conditioning and heat. There is a ton of natural light via large side windows and a large opening port overhead. The Catalina 36 offers a ton of storage in the main salon with deep storage cabinets to port and starboard as well as additional storage behind the salon seat cushions. 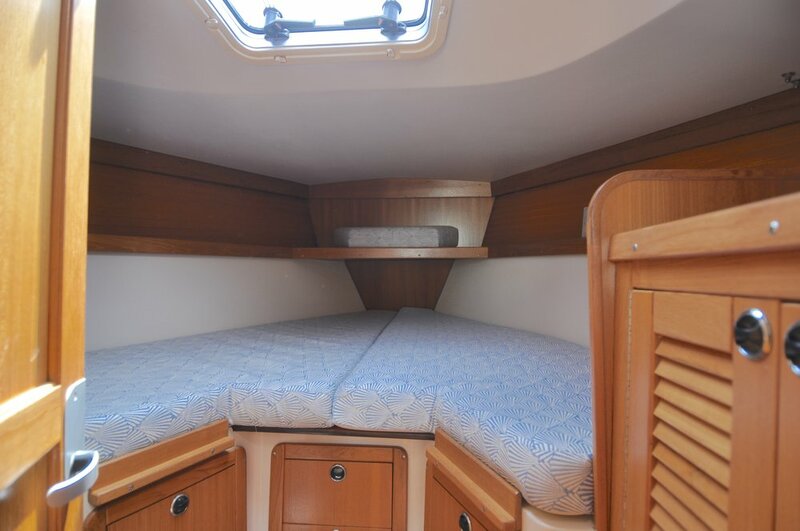 There is a spacious double berth in the aft cabin stretching athwartships. With a large overhead opening hatch to the cockpit, a hatch to the cabin top and a sliding port that opens to the galley for extra light, the aft cabin can have great ventilation. There is a large hanging locker to starboard along with three pullout drawers and a hinged cabinet for even more storage. Reverse-cycle air conditioning allows you to close off the cabin and cool off after a warm summer day of sailing. The current owners have added a 12v outlet below one of the two bronze reading lights so you can charge your devices from bed. The back cover of the engine can also be removed in the aft cabin to allow for easy access to the back of the engine. A lot of yachts in this size range can short change the forward cabin. Not so with this boat! There’s a large private cabin with a spacious v-berth queen. A removable center cushion allows for easy access to the berth as well as a huge amount of storage below. A large hanging locker lies to starboard with double cabinet doors and a vanity space above with a mirror cabinet for additional storage. Two storage shelves stretch forward along each side of the berth. A large overhead hatch lets in tons of natural light. The Catalina MK II design also features direct access from the forward cabin to the port head. The head of the Catalina 36 seems like it is the head of a yacht ten feet larger. Located forward of the main salon bulkhead to port, it is very spacious but does not impede on the design of the salon and living spaces of the interior. As appropriate for the wet environment, it’s a fiberglass space so it’s very easy to keep clean. It’s a function space with a designated shower seat, ample storage, and plenty of ventilation and natural light with two opening ports. The head also has walk-through access to the forward cabin. The shower and head are not an afterthought in the design so there is plenty of headroom, making the space truly functional. Face the facts…the cockpit is the lifeblood of any fine cruising yacht. This is where you spend 90% of your time onboard. You need comfort, convenience, and easy access to all the yacht’s systems for smooth and safe sailing. Catalina has mastered the sailing cockpit. With over five foot long cockpit seating and a beamy stern, the Catalina 36 MK II cockpit offers the perfect space for comfortable cruising and entertaining. Long benches and seat backs are perfectly angled for comfort when heeled during an athletic day of sailing. They’re also long and wide enough to be great for lounging under the stars on warm summer nights. The cockpit table is large and can support a full meal at anchor or snacking under way. Everything you need to sail the boat, single-handed or with crew is right at your fingertips without leaving the cockpit. The Garmin GPSmap 541s chart plotter is well located in a NavPod at the helm. Mounted above the chart plotter in a navpod are the Raytheon ST60 speed and depth instruments as well as the ST4000+ autopilot control. 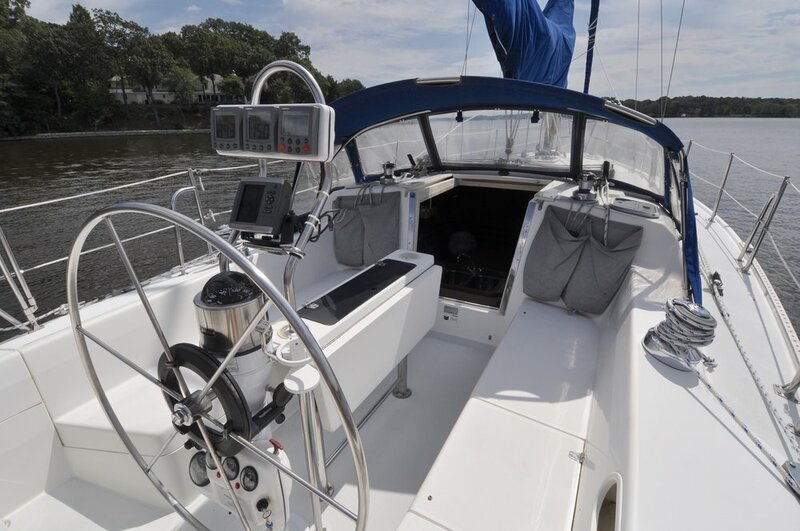 With minor help from the autopilot, you barely have to leave the helm to sail this boat. The primary winches are within easy reach of the helm. Carrying so much beam aft, Catalina has perfected the swim platform area of their yachts. Wide, open, and easy to access, this space has become an integral part of your time at anchor. WESTWIND also features a dodger and bimini for shade and protection from weather under way or on the hook. Cockpit cushions provide added comfort. Two stern rail cockpit seats also offer a comfortable perch and additional seating. WESTWIND is well equipped for weekend and bay cruising. At the helm, the bright and high resolution Garmin GPSmap 541S chart plotter sits right in the captain’s line of sight for easy navigation underway. The Raytheon ST4000 autopilot control is also mounted in the nav pod just above the chart plotter at the Edson pedestal allowing for easy single-handing. Raytheon ST60 speed and depth instruments are also in the nav pod at the helm. WESTINDS has a 35hp Universal M-35BC engine with 1,430 hours. Power is delivered to the water via a two blade propeller. The engine is checked annually by Bayshore Marine and the oil is changed every season. With a maximum RPM of 3200, the Catalina 36 can max throttle at 8 knots. This yacht is designed with ultimate simplicity and ease of handling in mind. The genoa is controlled by a furling line that runs along the port toe rail forward to the bow for easy furling. With the primaries so close to the helm, single-handing is so easy. Once away from the dock, set the autopilot into the wind, and deploy the main from the cabin top where the main sheet comes aft to the cockpit to a Lewmar 30 cabin top winch. The sails are the original Catalina sails.